You are here: Home / What's New / Fellowship Place thankful to break ground on long awaited project. Fellowship Place thankful to break ground on long awaited project. This week Fellowship Place broke ground on the final phase of the Campus Renovation Plan began in 2007. 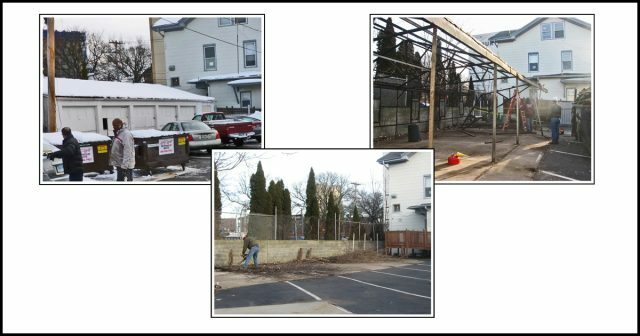 The project entails the demolition and replacement of a nonfunctional, dilapidated garage with a new maintenance storage facility. In addition to housing equipment and supplies, the facility will offer a maintenance job-training opportunity for clients who want to learn warehouse skills such as inventory tracking and storage. The project is being funded with a CT Non-profit Grant for infrastructure improvements from the Office of Policy & Management and private donations. With the support of various public/private partnerships, over the last 12 years Fellowship Place has transformed the once old and tired buildings that make up its campus, into vibrant welcoming centers where people living with a serious mental illness may find daily structure, an array of productive activities, and positive social connections. Special thanks to our supporters for making the campus transformation more than just a dream.